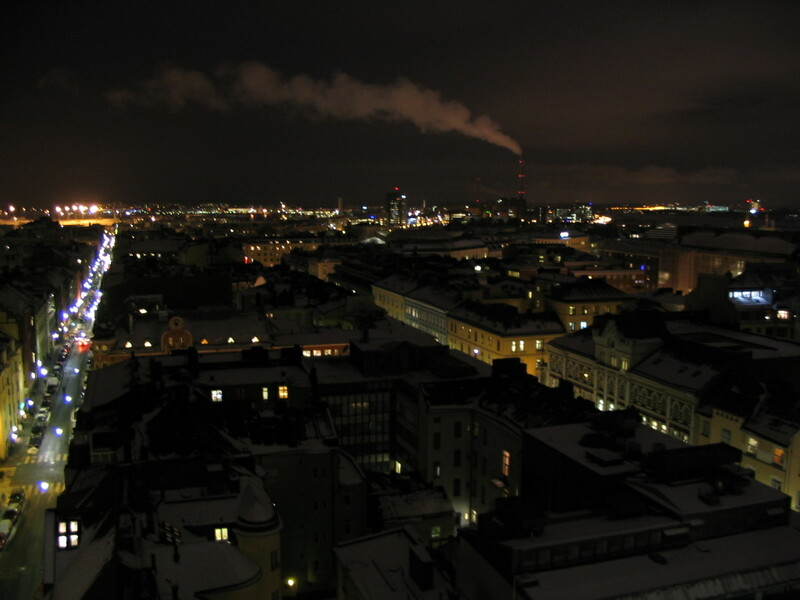 To start out: pictures from my arrival and first week in Helsinki. The weird waiting tube at Heathrow, where I waited to board my flight to Helsinki. Oddly airplane-like itself. 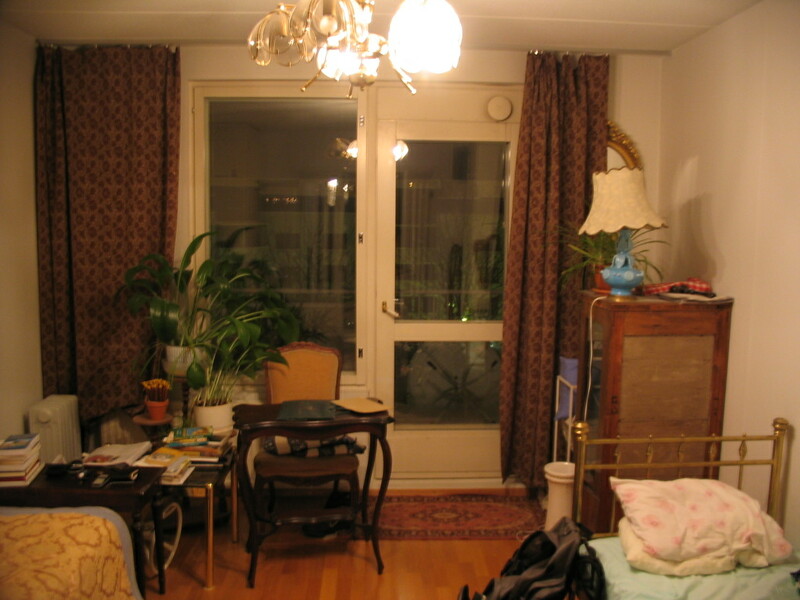 First picture taken in Finland: my bedroom in the apartment on Katajanokka, Helsinki, my bed on the right. It was a rickety setup but turned out perfectly comfortable. The view out to the balcony outside my bedroom and the courtyard beyond. 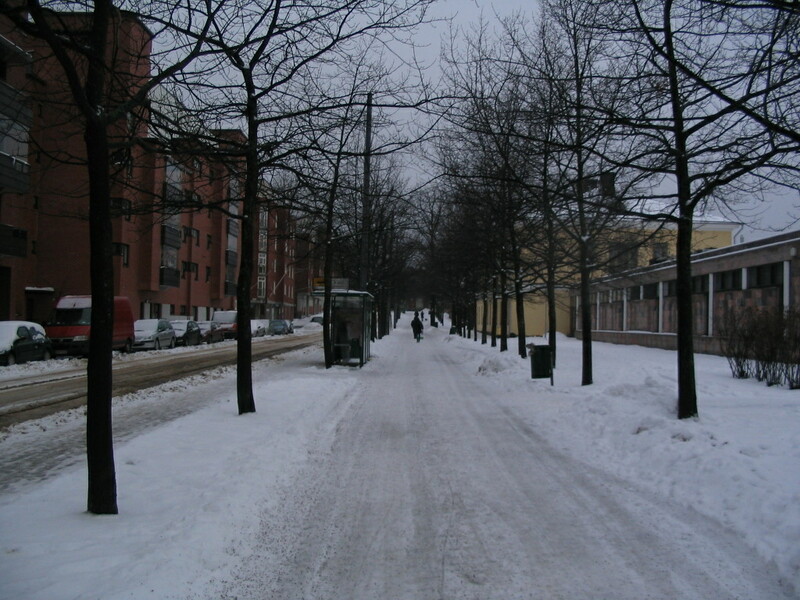 These conditions (snowy, dark, and cloudy) typified the first week there. 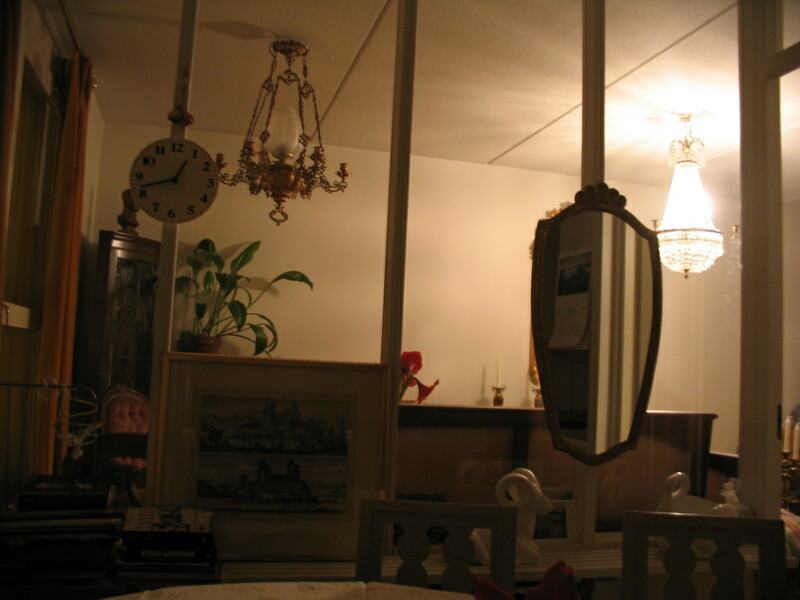 Looking from the kitchen table into the living room through their glass partition. 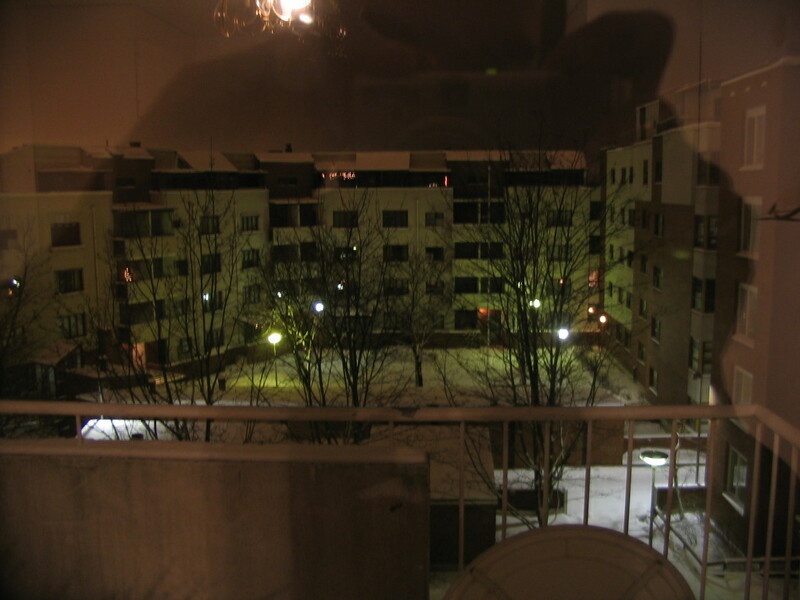 1/22/2014, 11:35 PM: On the very night of the fifth anniversary of my transatlantic flight, in looking up when exactly the trip started, I have discovered a forgotten folder of photos from a walk my roommates and I took from our apartment to the center of town on 1/25/09. This and the following ten pictures are selected from them. 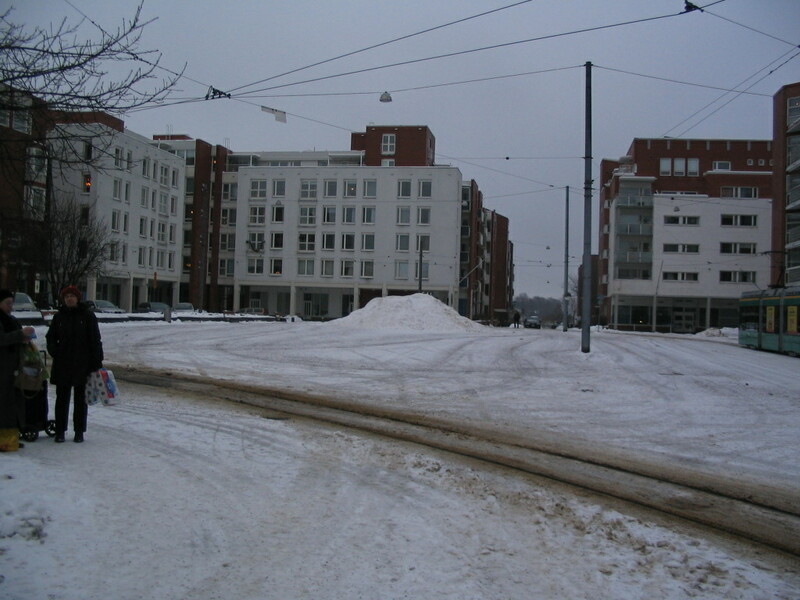 Here, a view of our apartment block (left) and the square, Merisotilaantori ("Seaman's Square"), that it faces. Also: an excellent plowmountain. 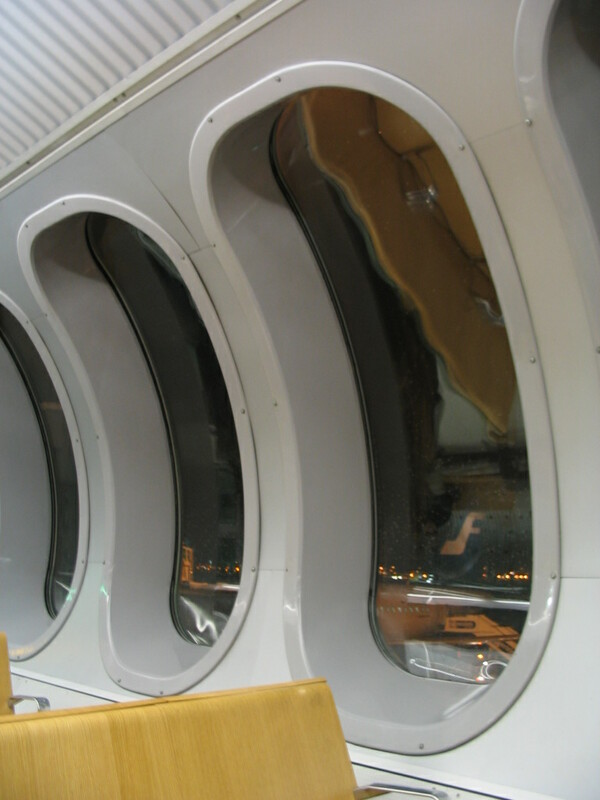 A glimpse of docked ferry. Up through this point, the walk was all on our home base of Katajanokka, which is an island to the east of downtown — but it's almost a peninsula, separated from the rest of the city only by a canal. Our apartment was at the eastern (i.e. outer) end. 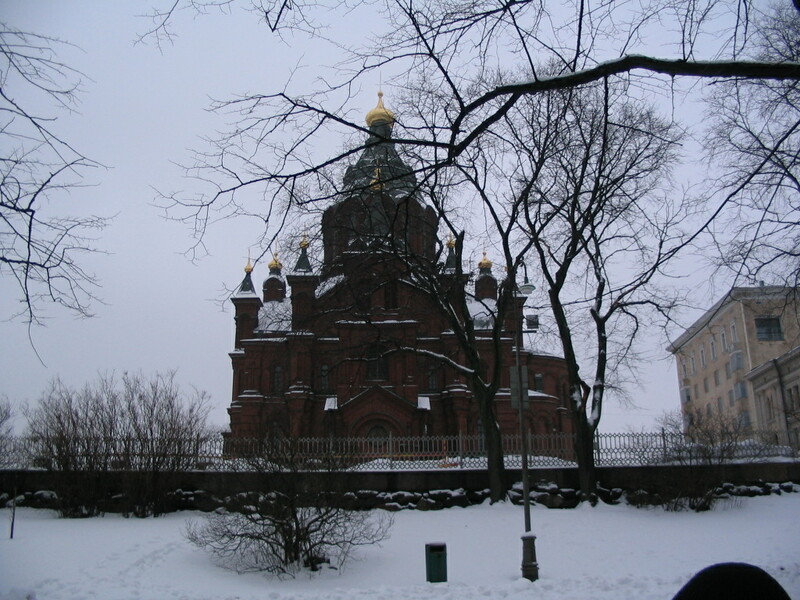 At the western end is Helsinki's Russian Orthodox cathedral, Uspenski, which see looming here. 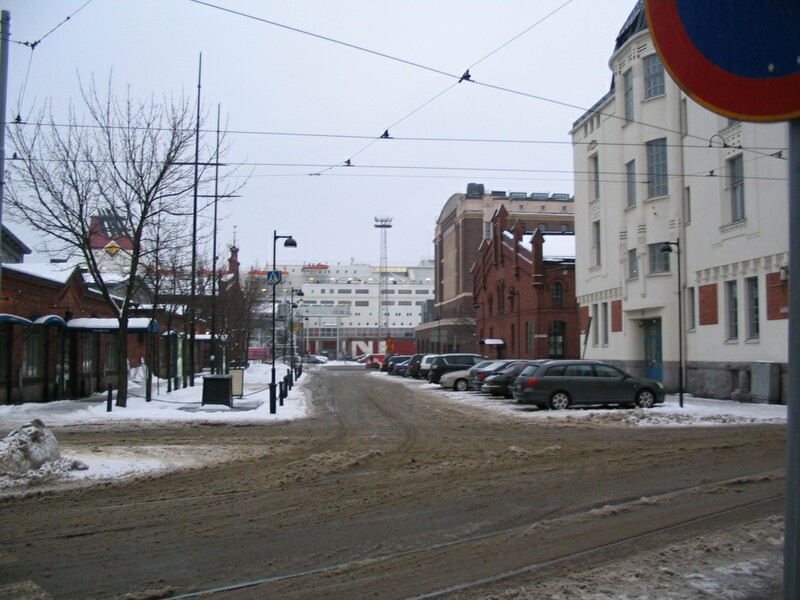 Once we crossed the bridge from Katajanokka to the mainland, another building reared up in front of Uspenski. 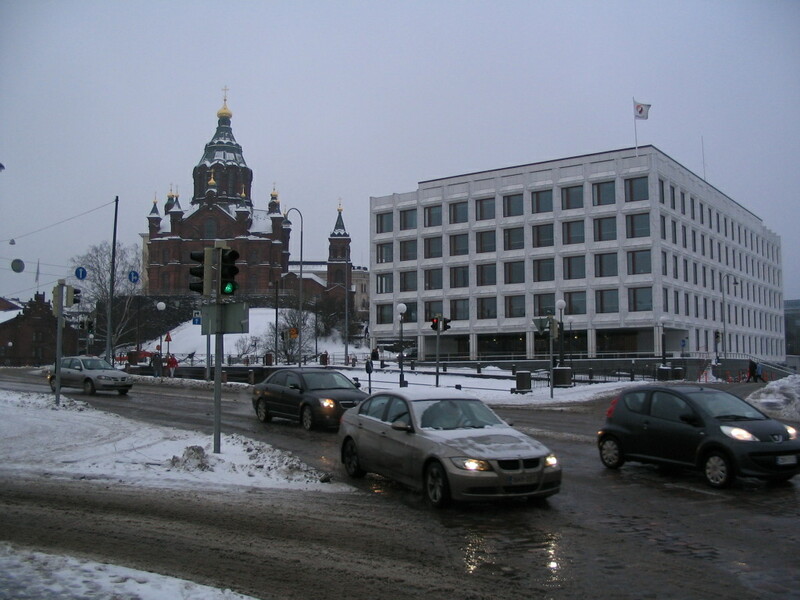 This is the headquarters of the paper company Stora Enso, designed by Alvar Aalto late in his career; due to its location at the southwest corner of Katajanokka, it's clearly visible from the market square downtown. In fact, it partially occludes the view from downtown of Uspenski. For this reason the Enso building is perhaps Aalto's most controversial work. 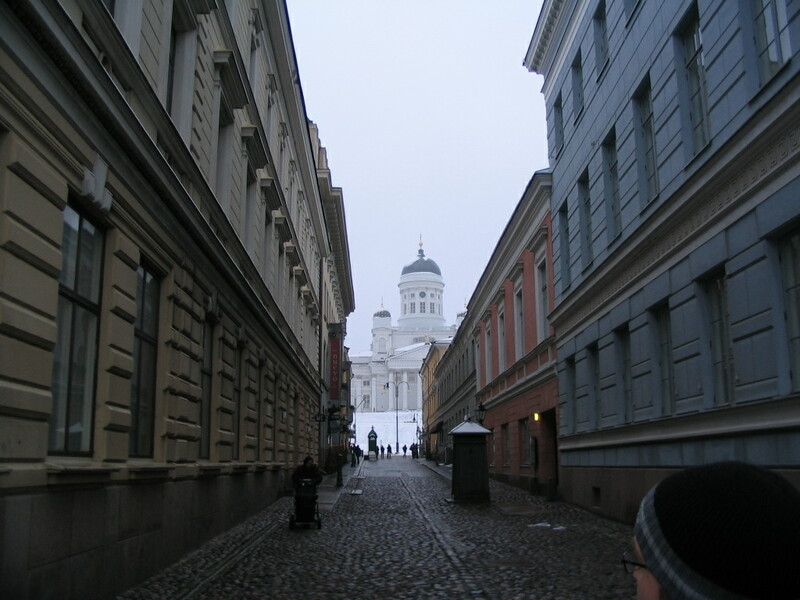 While proceeding along Pohjoisesplanadi ("North Esplanade"), we gleaned a ghostly glimpse of the (Lutheran) Helsinki Cathedral (Helsingin tuomiokirkko) via Sofiankatu. 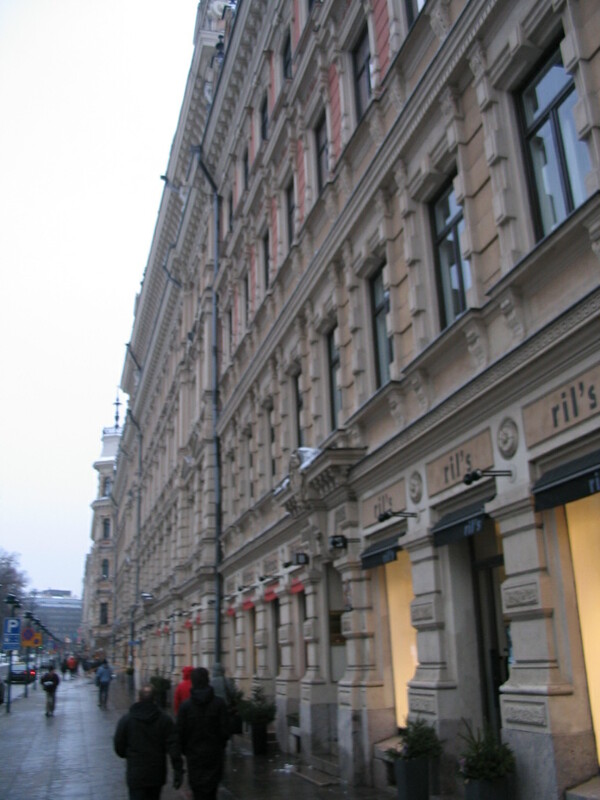 A well-rusticated façade on Pohjoisesplanadi. 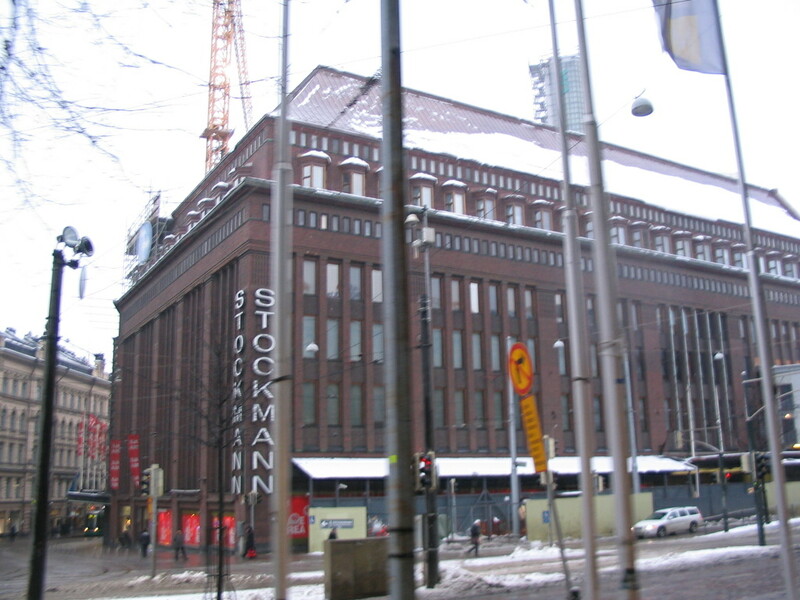 Stockmann, an iconic department store, sits at the nexus of three primary streets: Esplanadi, Aleksanterinkatu ("Alexander St"), and perhaps the most primary of all, Mannerheimintie ("Mannerheim Ave"). 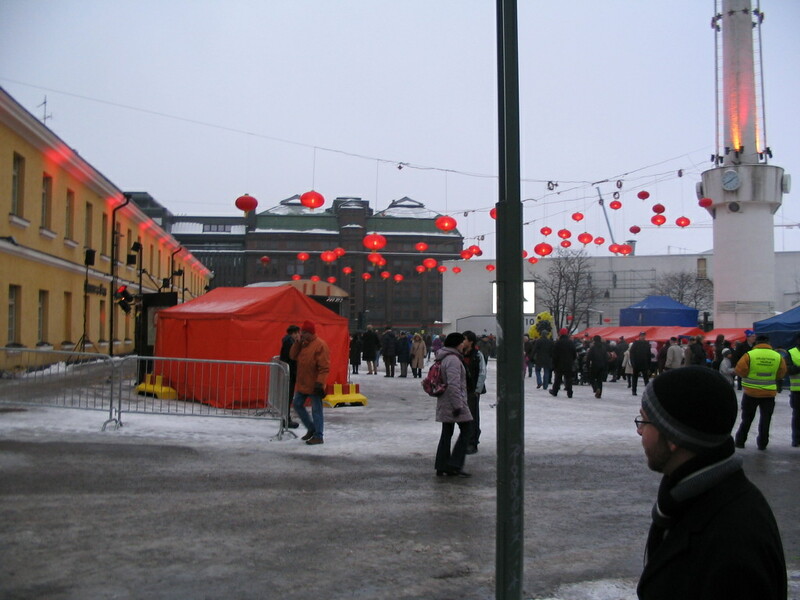 Incongruously but cheerfully, in the square Lasipalatsinaukio, a former marching ground, a Chinese festival was underway (perhaps for Chinese New Year?). Nearby is the multimodal transportation hub Kamppi, which we entered and explored. 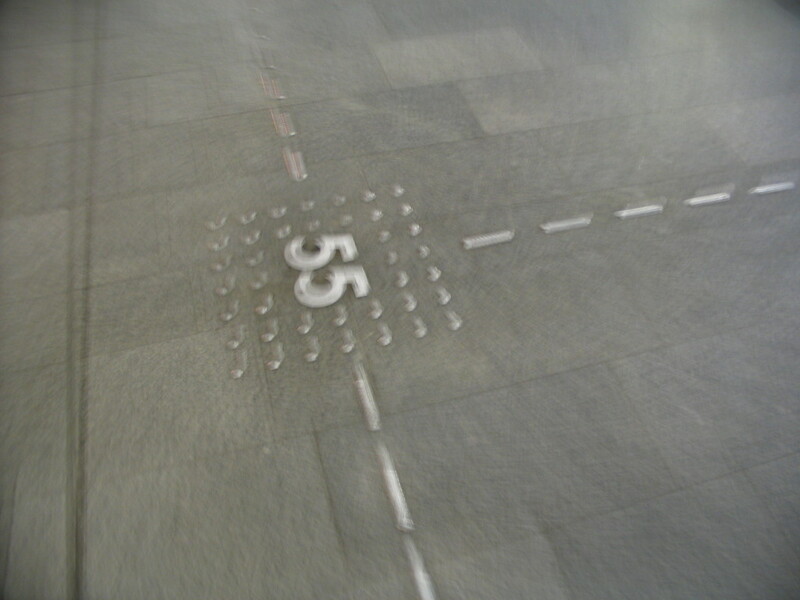 I was enthused by these classy inlays, which I think denote a place to wait for buses of corresponding number (but my memory thereof has grown hazier over these five years). 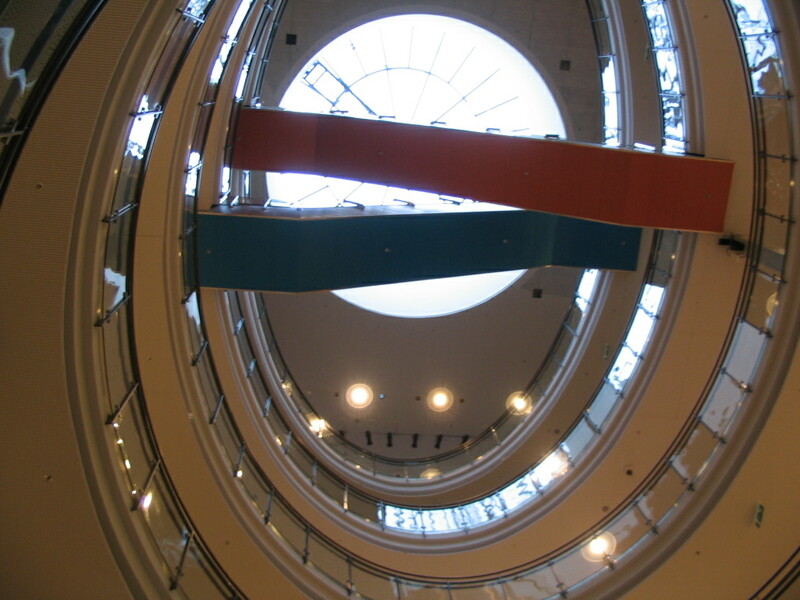 Kamppi is also host to a surfeit of shops, arrayed around this elliptical drum of space. 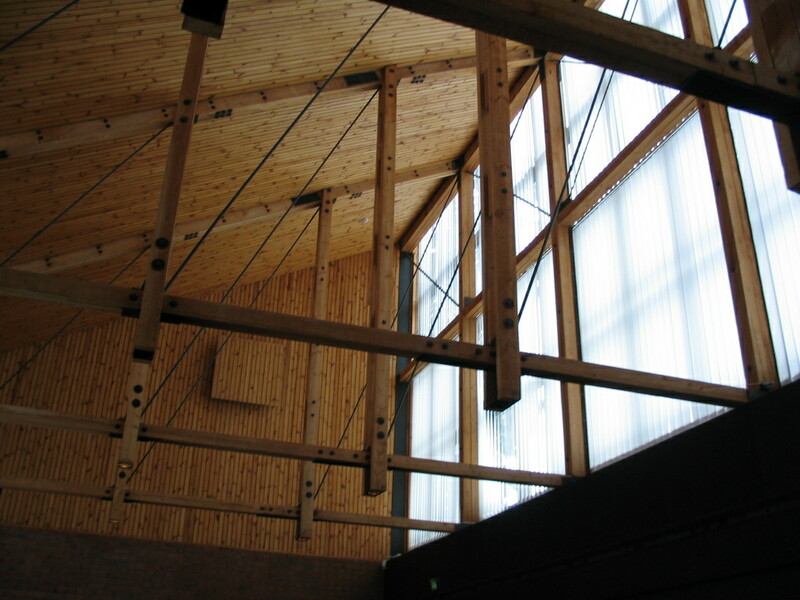 First glimpse of the main building at Teknillinen Korkeakoulu, or TKK for short — in English, Helsinki University of Technology. It's actually in Espoo, though, not Helsinki proper; Espoo is another municipality to the west and northwest of Helsinki. 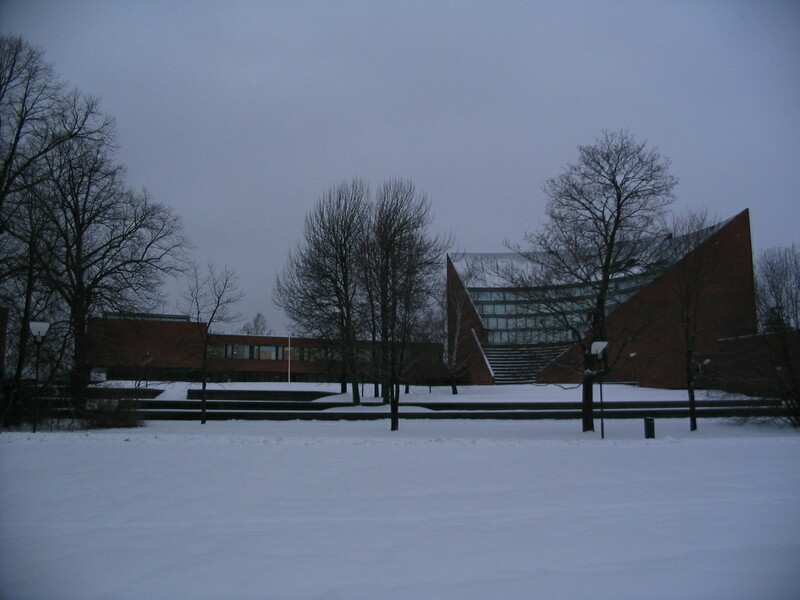 This main building is one of Aalto's iconic designs (completed 1965), many more of which we would encounter over the course of the semester, to my continual delight. 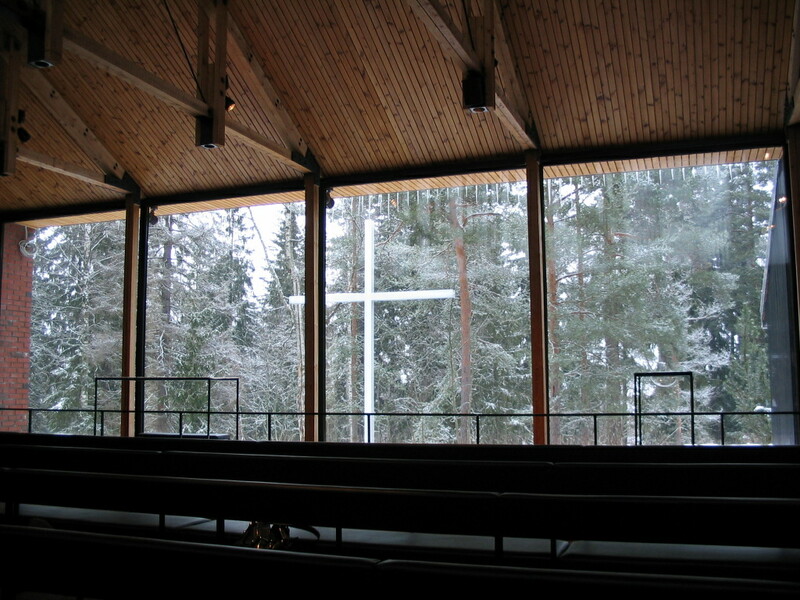 The TKK chapel, a nice example of Finnish modernism, as demonstrated here by the skillful use of wood and daylight. It was designed by Heikki and Kaija Siren and built in 1957. The rather compelling forward view in the chapel: its apse is the woods. 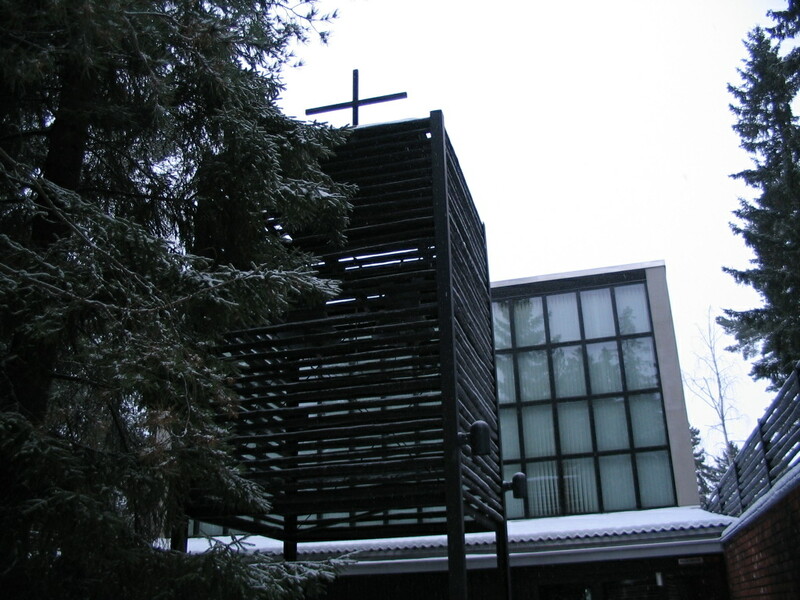 The bell tower of the chapel. 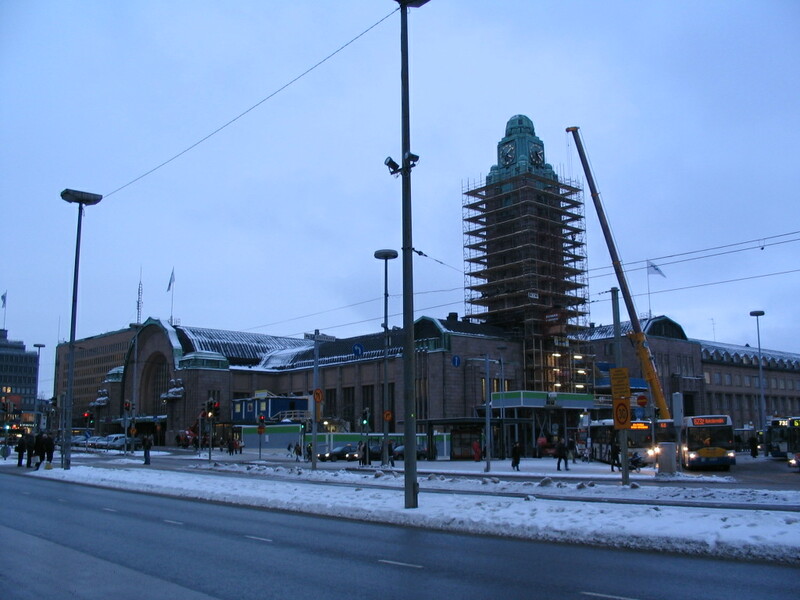 Helsingin Rautatieasema: the Helsinki central railway station, designed by Eliel Saarinen, its tower under renovation all through the semester, unfortunately. 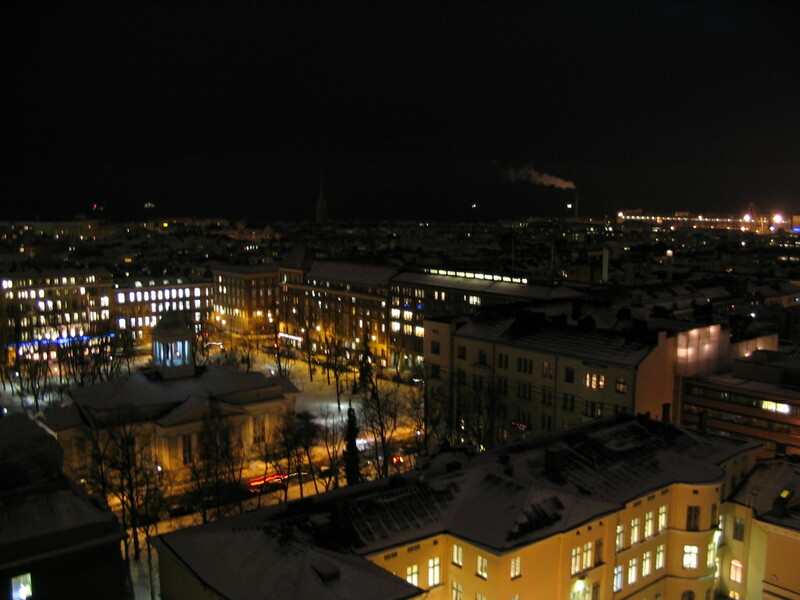 View to the southwest from Torni, Helsinki's tallest building, out toward the sea. 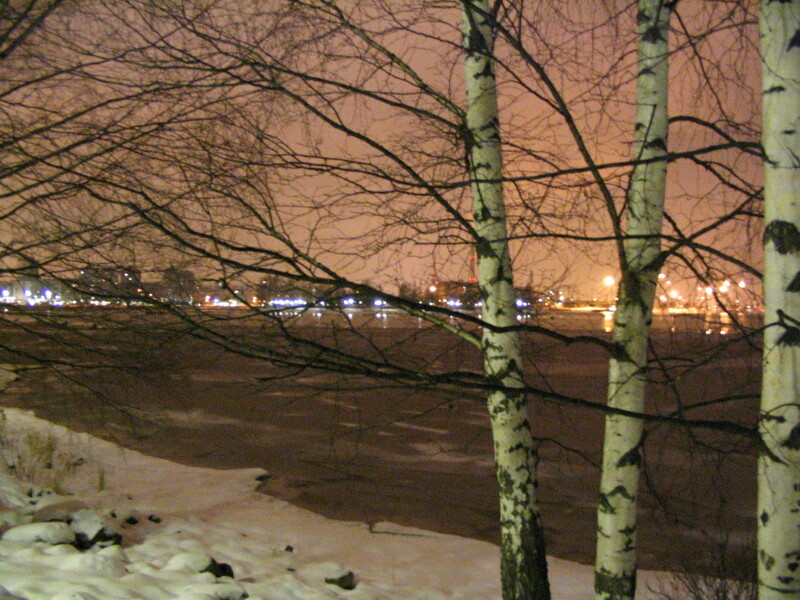 View from Torni to, I think, the northeast. This is from the walk along the north shore of Katajanokka. Further west is an area of older buildings in the typical fin-de-siècle style called Jugend, which is basically a toned-down Art Nouveau, and which I found quite lovely. 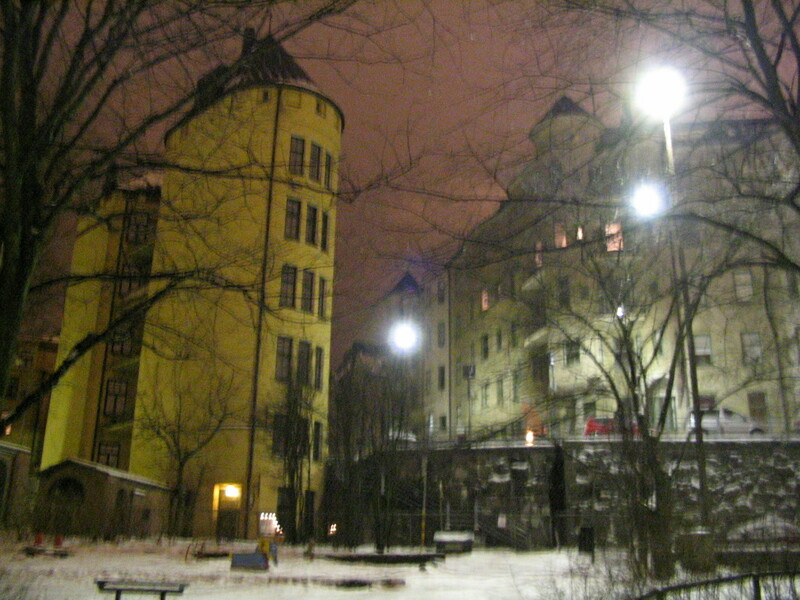 Many of the Jugend buildings on Katajanokka have names; the round-tower building to the left here, for instance, is named Wellamo, and it hosts a restaurant of the same name in its ground floor. View across the bay from the same area, toward the more northern parts of the city. 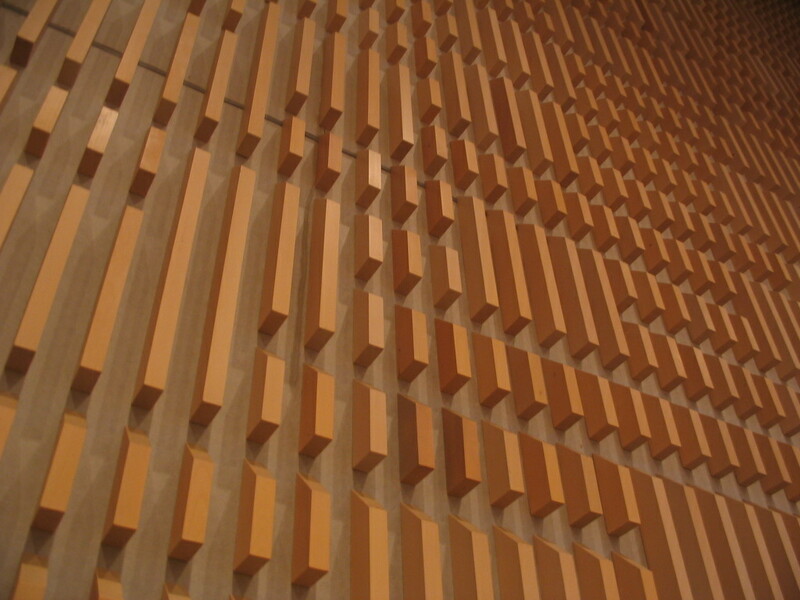 The acoustic treatment on the wall of the main chamber of Helsinki City Hall, which we toured.